2 hours and 15 minutes after I finished the Boot Camp with new teachers in Dublin Unified, I moved onto the next professional development offering for all teachers to occur on August 24. A survey had been given to teachers in the spring, asking them to choose what type of professional development would be most meaningful for them as a group prior to the school year beginning. Overwhelmingly, technology was a focal point. The data was mined and teachers went off for the summer. We had a number of administrative changes occur between June and August that impacted planning. I began by reaching out to the internal teachers that had been targeted as rockstars and slotted for sessions as presenters. I asked them to set aside the date and gave them a topic. I also told them we would begin planning on August 4. And that was as much information as I provided them. Fast forward to August 4, all of us met in a Google Hangout at 5 PM to discuss logistics, deliverables, and our goals as a team. I gave the teachers complete autonomy to build their sessions from their perspective as classroom teachers. We held one more planning meeting via another Google Hangout, conducted final planning via email, and all teachers were asked to solicit slidedecks to a Google site that I had created. It’s modeled much after the CUE Rockstar theme where teachers can go after sessions end and still access content as needed as well as view all content from other sessions that may be occurring simultaneously that day. As I like to, I threw an additional wrench into the formula. Our one high school in our district of 10,000 students has the most beautiful student union with gorgeous tall windows and a lot of steel. I had a vision of many teachers attending professional development in this building on the topic of Google Classroom. Here’s approximately 200 teachers attempting to access Wi-Fi all at the same time following a rather large email migration that required they reestablish their logins on the network. Many had only reopened their laptops after having been gone for two months, and we changed the WIFI access codes! Was I crazy? You bet. A 45 minute delay in the first session meant two thirds of the teachers could not access Google Classroom. The presenter, Kathy Proctor, a fifth-grade teacher at Amador elementary, handled it like a pro. She kept them going, had them team up, and dive in. The second session, led by A.J. Oliveira from Wells middle school went off without a hitch. 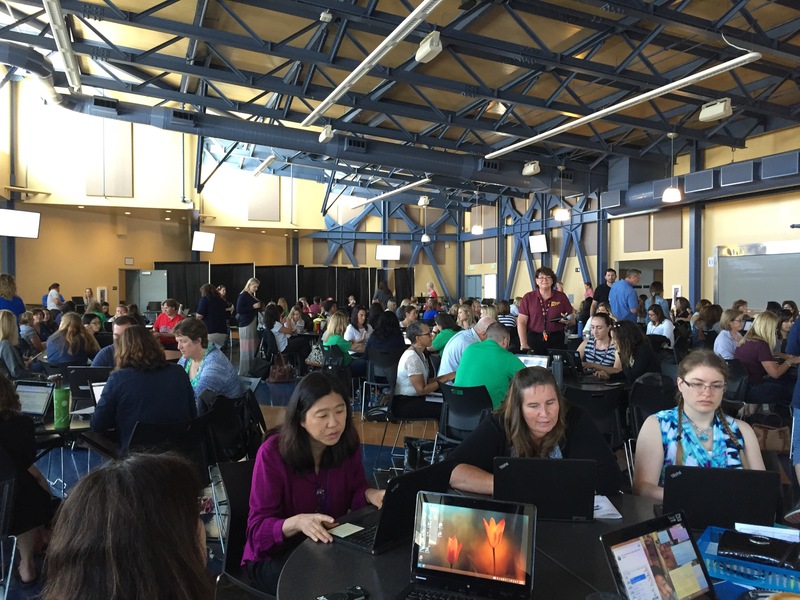 We held approximately 11 other sessions with a focus on Google APPS, Hyperdocs, and flipped classrooms. Infinite campus gradebook was also offered to roughly 100 teachers in our library. Every session felt the same pain with the 45 minute delay, every second session was successful. To continue the learning for the presenters and the attendees, I created a Google classroom called Dublin Unified Professional Development. 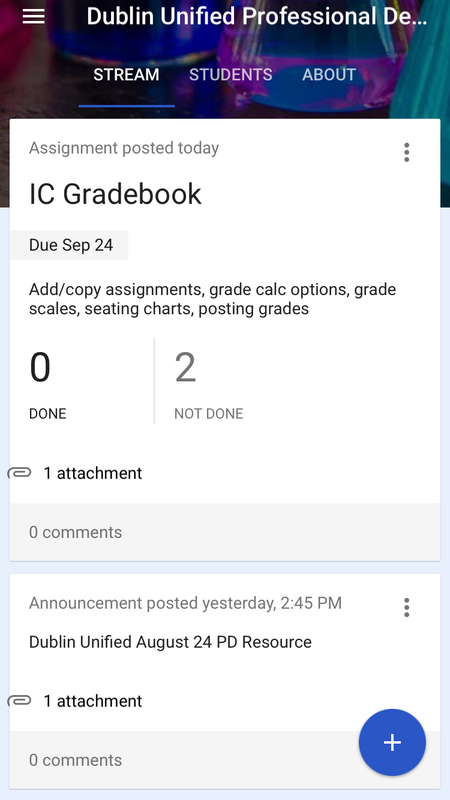 The goal of this classroom is to allow teachers to be students with their presenters from August 24 and learn about what their students will experience when they are the teachers in the room in Google Classroom ( Note: there is no real room in Google Classroom). Here’s my big takeaway– there is no gain without risk. End of story.